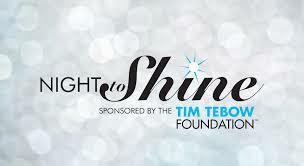 Link to Tim Tebow Foundation website! Click the photo to be directed to Tim Tebow Foundation's official webpage! These are the official Night to Shine Highlight Videos: 2015, 2016, and 2017. Through the Roof Minsitries at UMCPB has participated in 2016 and 2017 and looking forward to 2018!